On this page you can read about the services and products I offer. Single Handed Controllers – For gamers with disabilities. Xbox One Controller Monitor – Test the controller latency for your games. Xbox 360 Controller Monitor – Test the controller latency for your games. We build a lot of cool things on The Ben Heck Show for element14, so if you’ve got an original idea you’d like us to try, check out that community and drop us a line there. Besides what we build on the show, I am always open to new projects. from companies and individuals. Due to limited time, I typically go for larger projects such as promotional items for technology companies. If you’d like to talk with me about getting something done, here are some cost breakdowns which will give you an idea of what goes into an average custom project. Project design / assembly rate: $125 US / hour. Machine time for 3D printing / milling / laser: $60 US / hour. Parts and materials are extra. I come up with an estimate / rough design. Client pays remaining %50 of labor + shipping, project is shipped. If overages occur I’ll inform you of them for approval. All work is warranted against DOA. If problems arise in the future, contact me regarding repairs at a nominal cost. I am glad to sign any NDA your company might require and can submit W-9 forms upon request. Please email me to discuss any ideas you might have. Thanks and I look forward to the new challenges! You can now buy the Access Controller from eDimensional! It works on the PS2 / Ps3 and has interchangeable modules that allow you to configure the layout to what best suits you. It’s also wireless, so you can easily put it anywhere. Click here to visit eDimensional’s site for more info. 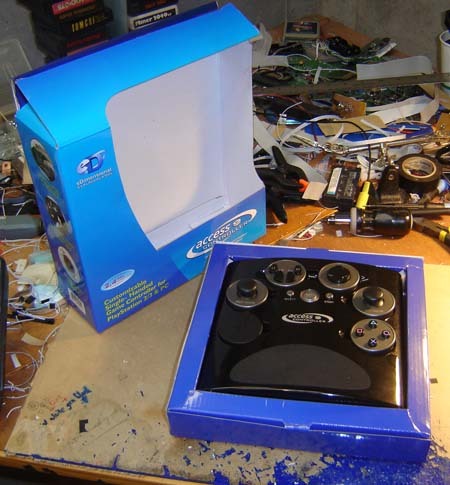 System modders: check out this page for instructions on how to mod this controller for your own use. Add foot pedals, extra buttons, anything you want! Available now! You can own the first mass-produced, non-book Benheck product. 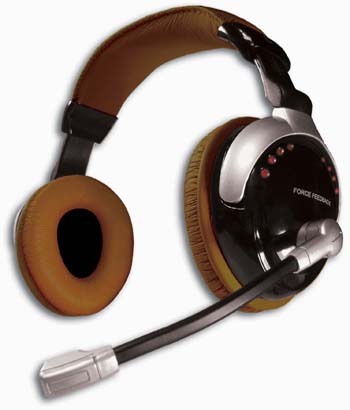 I personally use these when pwning noobs on Battlefield Bad Company 2. They feel great and sound ever better! Or maybe it’s the other way around. Either way you’re covered. USB 2.0, for PC use. Also works on the PS3! Please visit eDimensional’s website for ordering and more information. It’s available in bookstores or can be ordered online from Amazon. Makes a great gift for a tinkering videogame fan! To learn more about the book, or for information, support, links and files if you’re already building one of the projects from it, click here. hi, I have an access controller ( no use in right arm/hand), it came from Amazon, with ps3/pc converter. I plugged it into to ps3 machine but cannot get it to function. But it works on pc in test buttons when setting up on pc. I can only assume there must be a correct set up procedure for ps3, could you please point me in direction for how to set up Access Controller on ps3 please.